Heat the sesame oil in a large cast-iron saucepan on a high heat and brown the short ribs on all sides. Set aside. Add the sliced ginger, garlic and spring onion to the pan followed by the dashi or stock. Add the soy sauce and mirin, stir and bring to the boil. Place the short ribs into the broth, cover and simmer for 2.5 hours or until the meat is close to falling off the bone. Once ready, take the short ribs out of the broth and set aside, covering with foil to keep warm. Soy marinated eggs: soft boil the egg (4-6 minutes depending on size) then place into a bowl of ice water. Leave for a few minutes to cool down then remove the shells. Place eggs into soy mixture and leave to marinate until required. Soy bamboo shoots: add the ingredients for the soy bamboo shoots to a frying pan and cook until most of the liquid has been absorbed, set aside. Sieve the beef broth, place back on a low heat and stir in the Japanese curry roux cube, if using. Otherwise, combine 1 tbsp cornflower with 1 tbsp curry powder, 1 tsp garam masala and a splash of cold water. Combine into a slack paste and stir in. Once the broth has become curry-like, cover and keep on a low simmer. Cook the beansprouts and noodles according to packet instructions. Assemble the udon bowls: start with some beansprouts, followed by the udon noodles. Ladle in the broth until the bowls are quite full. 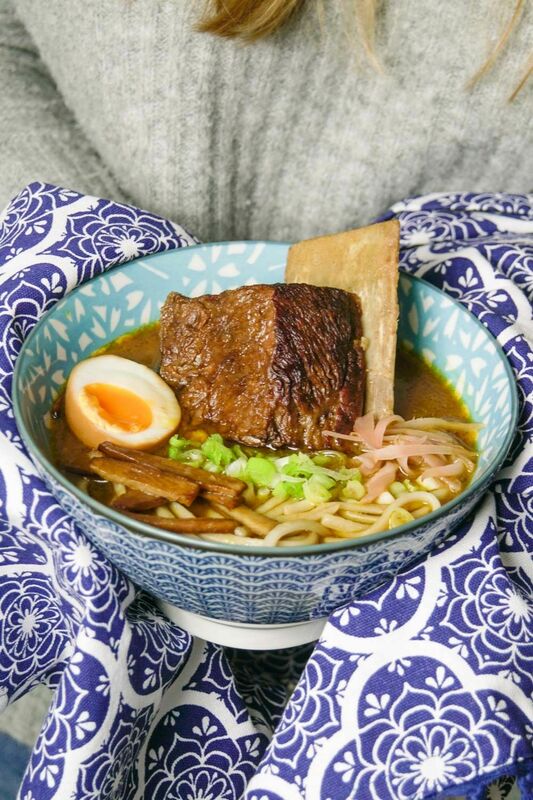 Place in the short ribs, followed by the soy bamboo shoots, ginger, spring onions and finally the soy egg, sliced in half. Serve immediately and enjoy! We were feeling very adventurous by serving the meat on the bone and eating it with chopsticks! If you don’t mind getting a bit messy, go for it, otherwise I would recommend that you chunk the meat up off the bone.